Rollout to the launch pad of the Soyuz rocket with the Soyuz MS-09 spacecraft inside, June 4, 2018. 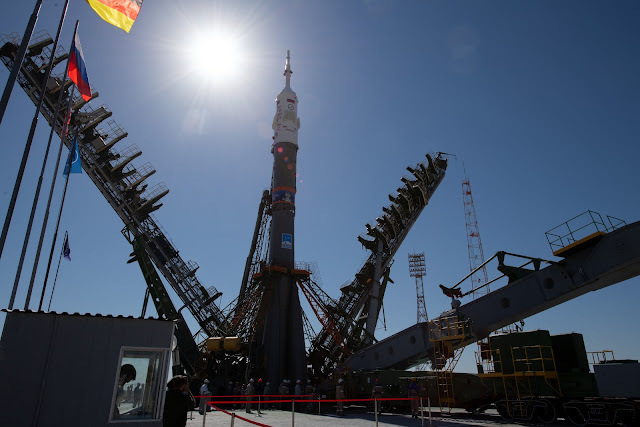 The spacecraft launched European Space Agency astronaut Alexander Gerst into space alongside NASA astronaut Serena Auñón-Chancellor and Roscosmos commander Sergei Prokopyev from the Baikonur cosmodrome in Kazakhstan on June 6. The 50-m tall Soyuz rocket propelled the astronauts to their cruising speed of around 28,800 km/h. Within 10 minutes of rising from the pad, the trio traveled over 1640 km and gained 210 km altitude. Every second for nine minutes, their spacecraft accelerated 50 km/h on average. The rocket is rolled to the launch pad on a train, the astronauts are not allowed to see this part of the launch preparation—it is considered bad luck. This will be Alexander’s second spaceflight, called Horizons. He will also be the second ESA astronaut to take over command of the International Space Station. The Horizons science program is packed with European research: over 50 experiments will deliver benefits to people on Earth as well as prepare for future space exploration.